Economically priced thermal lined pinch pleated drapery in Crosby is offered in four pretty colors to accent any room in your home. 100% Acrylic lining keeps the air conditioning indoors in the summer and the warm air inside your home in the winter months. Colors: Slate, Natural, Linen, and Sage. Made of 100% Polyester and is machine washable. 96"W x 84"L Single Patio Panel. Imported. PLEAT COUNT: 48" width has 10 pleats (five pleats each side), 96" width has 22 pleats, 120" width has 30 pleats, 144" width has 34 pleats. 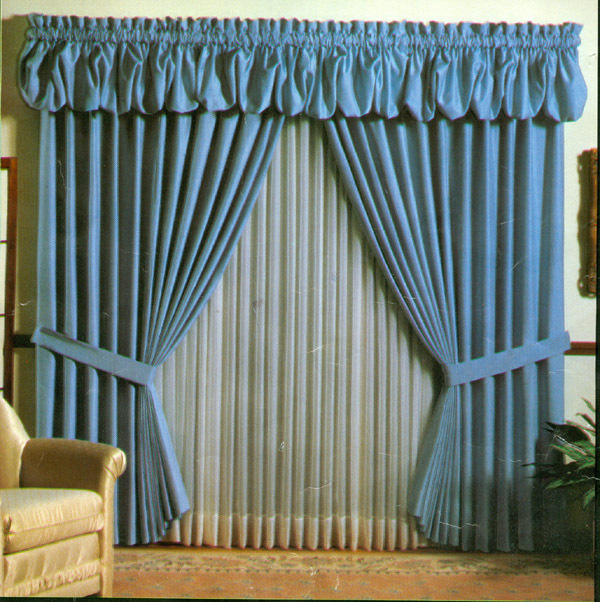 Our Custom made two or three finger pinch pleated drapes are made in the USA and lined with high quality combination lining of Luster Sateen lining on outside with flannel suede on inner side. 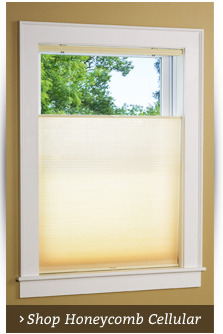 It provides a slightly lighter weight version of our Insulated and Room Darkening Pinch Pleated Drapery. Each pair is pre-pinned and has weighted corners. The pair is "fan folded" and ready to hang. You will love the meticulous workmanship and fabric quality we put into making you the best quality to be found anywhere! We make any width and length, by the pair or single panel. Call us for a quote toll free 866-886-3632. Almost Customs products are made specifically for you, and therefore can not be returned, except for defect in which case they will be picked up and replaced. Once fabric has been cut, Almost Custom orders can not be canceled. We highly recommend getting a fabric swatch prior to placing your order. Our customer service will happily assist you with sizing and other questions. The Thermalogic Ultimate Blackout Liner is an energy efficient insulated curtain panel. Warm air stays in during winter, cool air stays in during summer. Get a more restful sleep thanks to its room darkening characteristics. Plus, it saves you money on your energy bill, acts as a sound barrier so you can enjoy more peace and quiet, reduces glare on computer monitors and TV screens, protects carpets and furniture from sun fading, and is white on the reverse side to meet condominiums' requirements. Each panel has ½" side hems and a 1/2" bottom hem, and includes simple-to-follow instructions to attach to the back of your pinch pleated panel. The Ultimate Blackout Liner is washable. There's no need to trade in your favorite pinch pleat curtain if you need a darker, quieter and more energy efficient room. Now you can have the benefit of any beautiful pinch pleated curtain panel you like and turn it into a room darkening one. This blackout liner really is the ultimate option for creating the dark, temperate and peaceful environment you want at an unbelievable price. Hang it with the easy instructions provided and easily wash it whenever you feel the need. The Ultimate Blackout Liner's white reverse side ensures that your windows still look bright and clean when viewed from the outside. 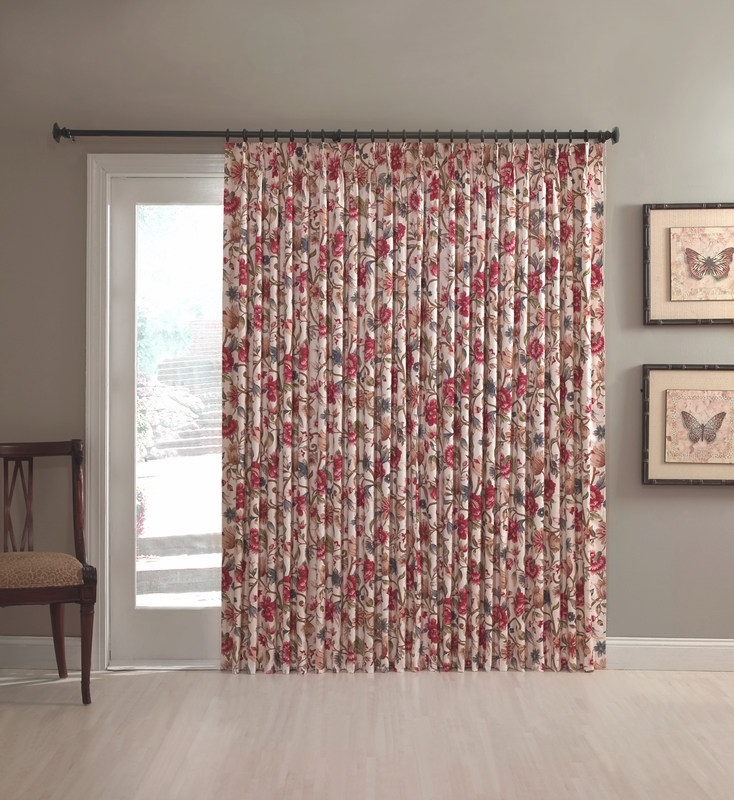 Beautiful Jacobean Floral pinch pleated drapery is both decorative and functional, keeping the cool air in during the summer and warm air in during the winter months, with its thermal control 100% Acrylic backing. This sensational fabric features an off white ground with blue tones, green tones, and tones of cranberry mixed with neutral tones. 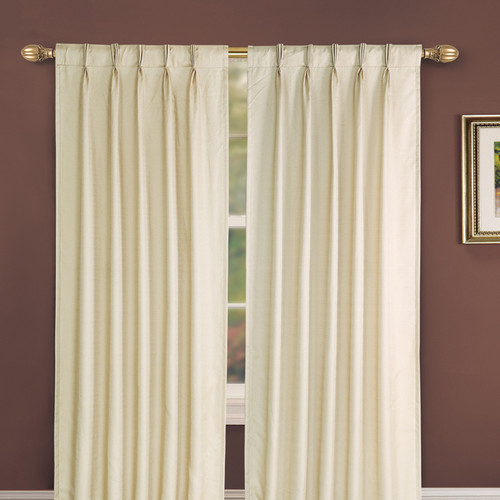 Drapes are measured from the top of curtain down. Fabric face is 100% Polyester. Machine washable. Fully lined and luxurious - the Claiborne Pinch Pleated Drapery has it all! It's soft texture provides eye appeal and is nice to the touch, while its medium weight fabric makes the Claiborne Pinch Pleat a fully functional drapery system. Excellent quality, expensive looking, the Claiborne is a great value for the price, but let it be our little secret. Fabric content: 70% Polyester 30% Cotton. Dry clean only. Made in the USA. Made in the USA. FREE FABRIC SAMPLES!! Our Fireside Solid Color program features a fabulous seven ounce Cotton Duck fabric face endowed with a white foam backing for thermal control and room darkening. A few sizes remain in Natural, Blue, Sage, and Navy. This ensemble works perfectly for those who have a condo or a community governing the outside appearance where white is required on the back side. However, most of our customers are homeowners looking for something inexpensive and somewhat casual with fabulous thermal control to help cut down on the electric or gas bill. Made of 100% Cotton Duck 7 ounce with foam backing. 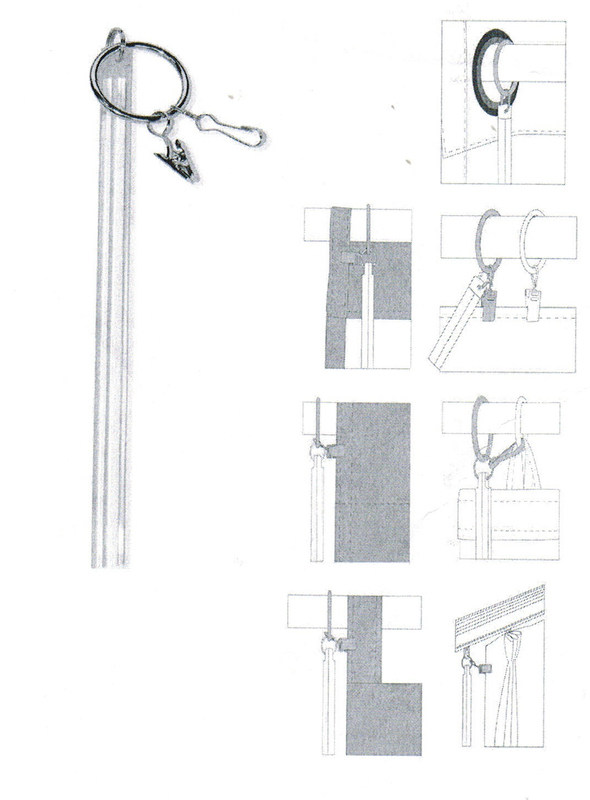 Pinch Pleated Drapery is measured from top of curtain down. Pins are not included. Set your pins to desired length. Dry Clean only. MADE IN THE USA. PLEAT COUNT: 48" width has 10 pleats, 72" width has 14 pleats, 96" width has 22 pleats, 120" width has 30 pleats, 144" width has 34 pleats. Our pinch pleated sheer curtains are made to measure sheers with the following attributes: * Weighted corners * 4" top buckram with double turn on top * 1 1/2" double fold side hems blind stitched * Bottom hem 4" double fold * 100" Polyester, FIRE RETARDANT and fade resistant Pin hooks can be set in place for an additional charge, either the standard wall hang or ceiling hang. If electing pin hooks to be set, must specify. Media Faux Suede Pinch Pleated Drapery is a solid color insulated 100% Polyester fabric backed with 100% Acrylic Suede. Media features knife pinch pleats, 3 1/2 inch heading with pellon, 1 inch side hems, and 1/2 inch bottom hem, and is machine washable in cold water. 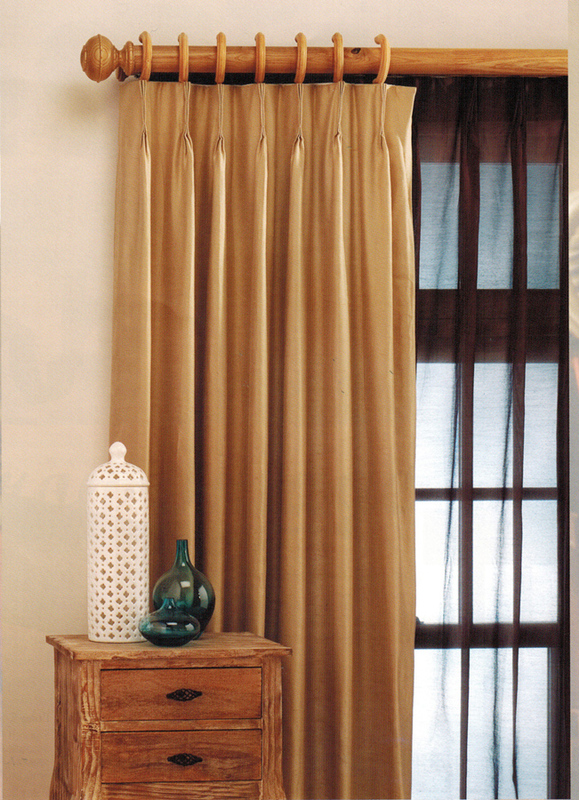 Media Faux Suede is a luxurious and energy efficient insulated curtain choice. Warm air stays in during winter, cool air stays in in summer. 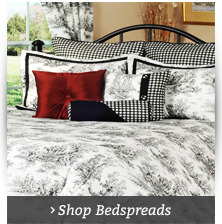 * Get more restful sleep thanks to its room darkening characteristics. * Acts as a sound barrier so you can enjoy more peace and quiet. Media Faux Suede Pinch Pleated Drapery is a solid color insulated 100% Polyester fabric backed with 100% Acrylic Suede. Media features knife pleats, 3 1/2 inch heading with pellon, 1 inch side hems, and 1/2 inch bottom hem, and is machine washable in cold water. It is room darkening and insulated. There's simply no denying it: everyone loves the look of a full-length window and there's no better way to achieve that look than with a set of pinch pleated curtain panels. 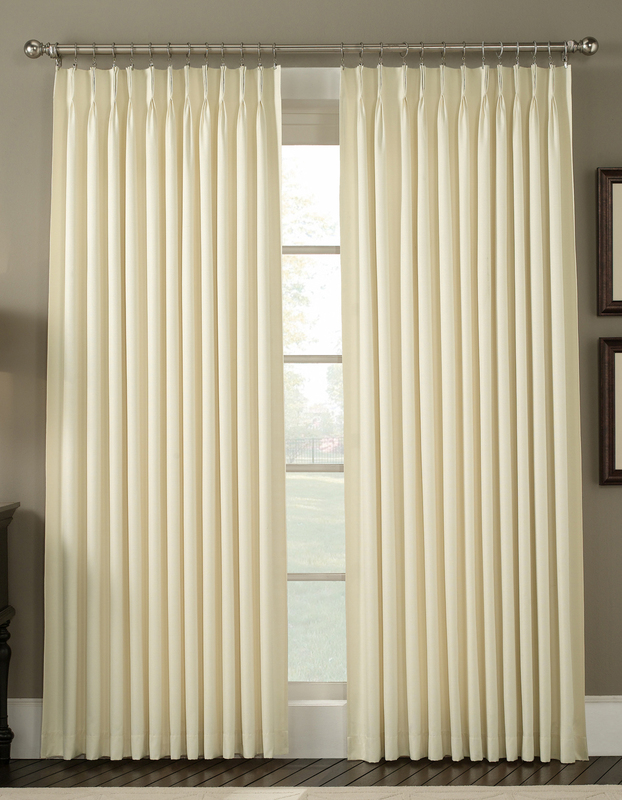 Full-length pinch pleated drapes offer privacy and temperature control to help your space function at its best. Shop our complete selection of pinch-pleated drapes at The Curtain Shop for an easy and affordable way to dress up the windows in your home. Whether you're shopping for pinch-pleated drapes for traverse rods or super stylish patio door pinch pleated drapes, you'll find just what you need at The Curtain Shop. Our selection of pinch pleated drapery is made with flame and fire-resistant fabrics for extra safety throughout the year. We also offer thermal pinch pleated drapes that will help to make your home more energy efficient by lessening air flow around windows to keep rooms warmer in the winter and cooler in the summer. 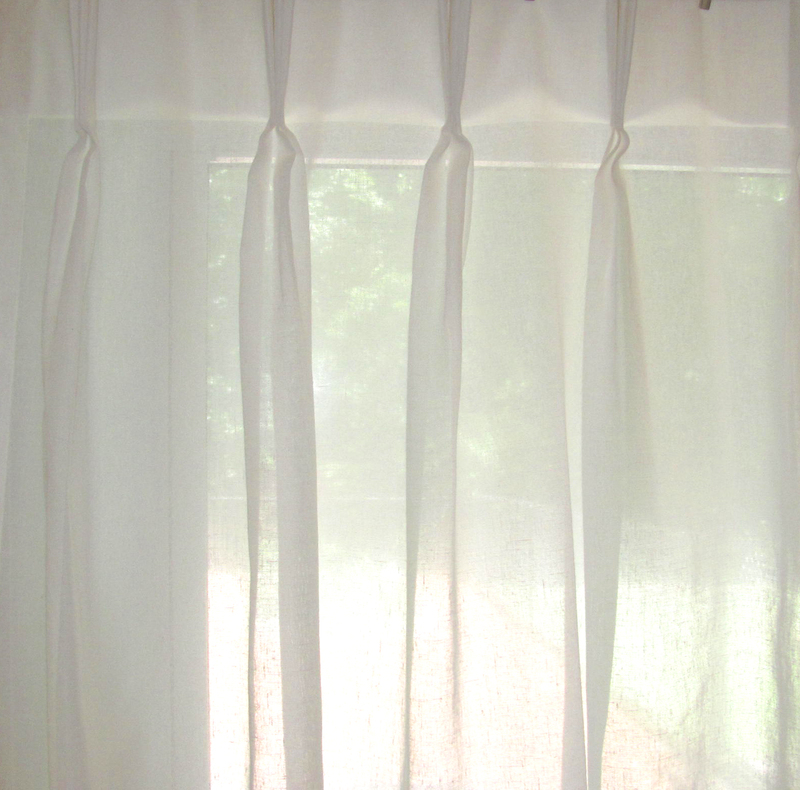 TheCurtainShop.com also offers the Ultimate Blackout Liner to pair with your pinch pleated curtains for extra insulation and nearly complete sun blockage. 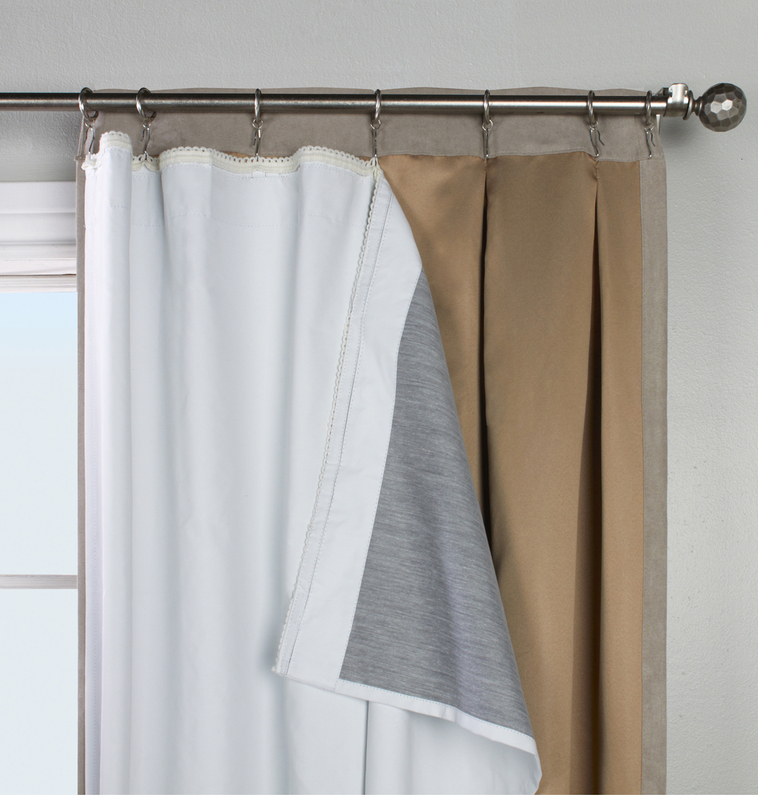 Our collection of pinch-pleated draperies includes a variety of materials and styles. From light, colorful fabrics to heavy-duty winter materials and designs, The Curtain Shop offers something for everyone. If you don't see the exact fabric you have in mind, try our Almost Custom feature, which allows you to achieve a custom drape design at a fraction of the cost of other custom drapery services. Call The Curtain Shop today at 1-866-886-3632 for more information on this unique offer. 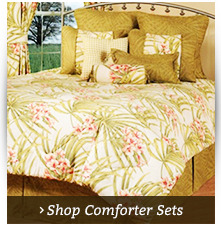 While you're shopping, don't forget rods for your new curtains. We carry basic or designer rods for pinch pleated curtains and other accessories for easy hanging and a professional appearance. Additionally, we offer high-quality Thermalogic curtain liners for full-length windows that pair perfectly with pinch pleated curtains. 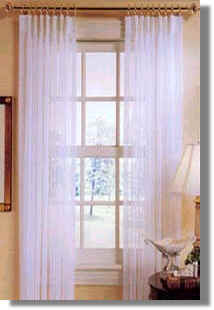 Trust The Curtain Shop for all of your window treatment needs. We have been in business since 1953 and in 2001, we expanded to include an online store. 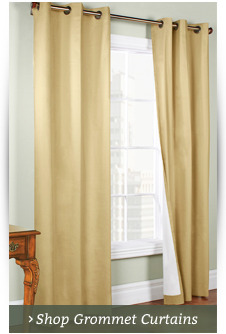 When it comes to keeping your full-length windows looking fabulous, The Curtain Shop has you covered.